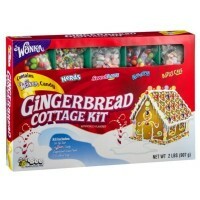 A well-loved holiday tradition, Gingerbread Houses are attractive, delicious, and so much fun to make! 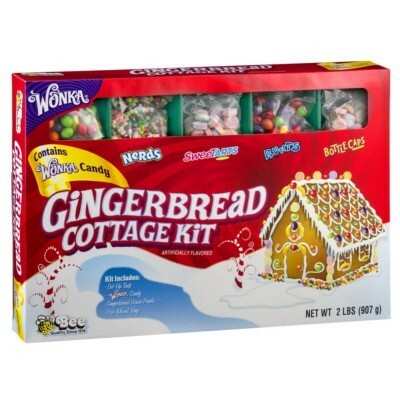 Now Wonka brings you a candy-covered gingerbread cottage that will please American food fans of all ages! Each kit comes equipped with your favorite Wonka sweets, including rainbow Nerds, Sweetarts, Runts, and Bottlecaps, along with the walls and roof for a 13x13x10 cm decorative house (approximately 5x5x4 in) and vanilla-flavored white frosting. A fantastic gift and a great activity for the whole family, this gingerbread house kit will be first on everyone's wish list! Nerds, Sweetarts, Runts, Bottlecaps: dextrose, sugar, maltodextrin, acidity regulators E296-E338, less than 2% of: corn syrup, calcium stearate, natural and artificial flavors, glazing agent E903, colors E120-E150-E133-E132-E129*-E102*-E110*. Gingerbread: wheat flour, sugar, partially hydrogenated vegetable shortening (soybean, cottonseed palm and/or sunflower oil), inverted syrup, natural flavors (ginger, cinnamon), leavening agents E500ii-E503ii, salt, color E150, soy lecithin E322, sodium metabisulfite. Icing: powdered sugar (sugar, food starch), water, sugar, corn syrup, colors E171-E133, salt, acidity regulator E570, agar, preservatives E202-E211, artificial flavor. Manufactured in a facility that also processes egg, peanuts, milk, crustacea and fish. *May have an adverse effect on activity and attention in children. Contains GMO. Nutrition facts (for 100g): calories 379Kcal, total fat 1.3g (saturated fat 0.4g), total carbohydrate 86.2g (sugar 73.3g), protein 1.7g, salt 0.4g. Super sympa . Très ludique pour les enfants. Original et simple à monter. Super activité d'intérieur pour ma fille de 3 ans qui est malade depuis un mois et qui doit donc rester au chaud. Elle a adoré et nous aussi. On recommence l'année prochaine ! Es una casita de jengibre preciosa. A mi hija le ha encantado. Enseguida se ha puesto a hacerla y le ha quedado muy chula. Ma fille et moi nous sommes éclatées à monter et décorer cette maison dont tout le matériel est fourni et dont la réalisation est très facile.